ABSOCOUPLER - MWN Trade - Delivery of parts and accessories "just in time"
ABSOCOUPLER transfers the data and power between converter of the fixing device and moving device by the contact-free data-transmission system. Because of the magnetic materials and coils which comprise the interior of transmission heads, the transmission heads make magnetic coupling between sides of fixing and moving devices. The power and data signals are transferred by sending „AC signals” to the part that has the magnetic coupling. Best solution for the replacement of slip-ring. The power and data are transferred between fixing and moving devices by using the data transmission head without contact. The data can be transferred even though glass,resin, or non-metal material are between transmission heads. NSD has several kinds of heads according to your purpose. The converter’s power of the moving device is supplied from the converter for fixing device by using data transmission head. In addition, the power can be supplied to the external devices (solenoid, PLC, or analog sensor) which are used at mobile station side. Up/ down: each 24-point (Up (low power type: 16-point)) The signals can independently be transferred bi-directionally. The analogue signals can be transferred by 2-channel from the fixing and moving devices side. Since the semiconductors (ICs) aren’t used in the transmission head, the structure has environment resistance. The slip ring which is used in filling machine, cable reel, and turret is likely to get a malfunction because of the brush contact failure. Therefore, it needs maintaining very often. If you replace with ABSOCOUPLER which has contact-free transmission structure, it would have no contact failure and need no maintenance. 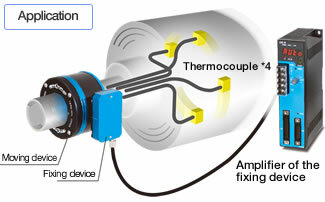 The thermocouple wiring is mounted on the terminal block at the data transmission head of the moving device, thus it is easy to plug or unplug the thermocouple. 4-CH measurement data is transferred from moving device to fixing device without contact, and the analogue signals output from the amplifier of the fixing device. The data transmission head is easy to mount on the equipment because the data transmission head of the fixing device is put at near the moving device head. The roll can be replaced without removing the data transmission head of the data transmission. The temperature each sensor’s CH, the temperature inside of the moving device, and the operation state of non-contact communication can be monitored by the amplifier’s panel of the fixing device. In addition, an error state can be detected and output by the contact point.